One of the great manufactures straight from the Assassins Creed universe. 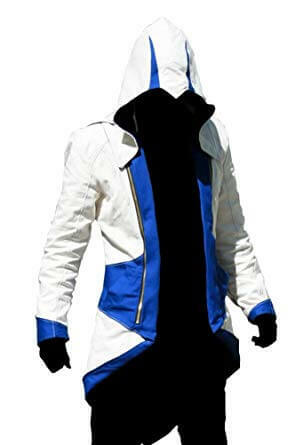 You are going to show signs of improvement with this productively rich blue and white Connor Kenway Jacket. Made with real calfskin and further installed with an exceptional thick coating to offer you the most extreme body-contact comfort. All in all, this coat is a style claim all things considered and a padded more settled from within. This Leather Jacket is a detailing of the best quality pure calfskin, and it includes an inward gooey covering to keep you agreeable. The highlights of this coat include a hooded neckline, secured sleeves, and two-way front zip. It likewise comprises two inside and two outside pockets. Having the one of a kind most different front zip terminations, a separable pointed mouth hood, the coats extraordinary plan pays praise to the diversion character himself. Having no pockets outwardly, the red and white structure alongside the trendy catch sleeves set in consummately in agreement to the amusement character. At the back of the coat, the long folds can be either fastened to give the ideal Kenway look, and can likewise be unfastened to give a look of a smart long coat.